Himalayan balsam (Impatiens glandulifera) is an introduced summer annual that has naturalised in the UK, mainly along riverbanks and ditches. It prefers moist soils but will grow pretty much anywhere. Plants can grow up to 3m tall, making this the tallest annual species growing wild in the UK. A native of the Western Himalaya, it was introduced in 1839 to Kew Gardens as a greenhouse exotic. It escaped into the wild and is now recorded throughout the UK, particularly along the banks of watercourses. It is locally common in Wales and England. It is less frequent in the Highlands of Scotland and western parts of Northern Ireland, but it is rapidly increasing its range. It grows quickly, spreads easily, readily colonises new areas and out-competes other vegetation. When the plants die back each winter they leave large areas of bare ground that can be sensitive to erosion. The hollow, succulent stems are purple tinged and smooth. The serrated, pointed leaves are arranged in pairs, or three to a node; they are mid green with a pinkish mid-rib and about 12 to 16cm long. Flowers vary from pale pink to purple and appear from June to October. Their shape resembles an English policeman’s helmet (which is their common name in some parts of the country). They produce copious amounts of nectar and are thought to draw pollinating insects in preference to native plants, thus reducing pollination of the latter. A single plant can set about 800 seeds, 12 to 14 weeks after flowering. The mature seed capsules react to the slightest disturbance, causing the five segments to split along their length, then curl up and twist explosively, projecting the contents up to 7m away. 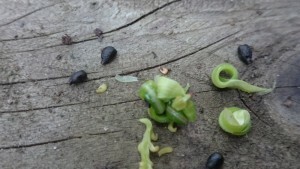 The black, round seeds are about 2 to 3mm across and remain viable in the soil’s seedbank for about 2 years. They are buoyant and can travel long distances along waterways to infest new areas, even germinating under water. The plant is easy to cut before flowering, either by hand or machine, provided there is adequate access. Plants should be cut to ground level before the end of June and before flowering. Earlier cutting results in rapid regrowth of new stems that will flower and set seed, whereas later cutting risks spreading viable seeds that can germinate next growing season. Cutting is only effective if made very close to the lowest nodes, near ground level. Regular mowing will also control plants even if the cutting level is above the lowest node, provided the frequency is sufficient to prevent the formation of flowers and seeds. Grazing by cattle and sheep can also be an effective cutting regime and should begin in mid-April, continuing throughout the growing season. Small infestations can be controlled by hand pulling, as the plant is shallow rooted. However, this can be quite labour intensive. The seedbank lasts for approximately 18 months, so two years’ control should eradicate the plant if there is no further reintroduction to the site from upstream seeds. It can be controlled by spraying the foliage with glyphosate. The plants should be sprayed in the spring before flowering but late enough to ensure that germinating seedlings have grown up sufficiently to adequately absorb the herbicide. Small infestations and individual plants can be controlled by using glyphosate in a weed wiper. This has the advantage of minimising herbicide effects on non-target species. The herbicide 2,4-D amine controls many broadleaved annual weeds and can be used on Himalayan balsam. It is a selective herbicide that will not kill grasses, which can help to keep banks stabilised, making it useful sometimes to use instead of glyphosate. 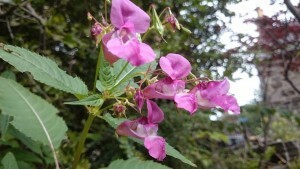 We can help solve your Himalayan balsam problem. We can be contracted directly to carry out the site works outlined above, or employed in a consultancy role to map areas of invasion and provide detailed management plans to eradicate the problem. Please contact us for more details on our services and to discuss your specific needs.